My Thoughts: I picked this book up after it had been sitting in my TBR a while. I'm sorry I waited so long! I thoroughly enjoyed the story! We are introduced to Cass who sees ghosts, she is termed weird by all the other students at her school. Nobody wants to talk to her, or be seen with her. She has a few friends who are ghosts so she doesn't mind it too much, she always has "someone" to talk too. She discovered she could talk to ghosts after her sister's death. Yes, her sister stuck around and now talks to her. I love her "friends" and how they tell her all the gossip on everyone! They are always there to hear the best stuff! We than meet Tim who is the guy who is popular. He starts to bug Cass about helping him with "something." I won't say much more, spoilers! I really liked this book. It flowed together well! The story fit, the characters fit. It did remind me a little bit of the tv show Ghost Whisperer, but in my opinion that is wonderful since I love that show! But it has its own complete story and its a wonderful novel. I really felt like I was getting to know Cass and was really enjoying having Tim around. Tim was going through a lot in in his life and I could relate to the both of them very much. There wasn't much romance in the book but enough to make it worthy. It was a great first novel for Megan Crewe!! 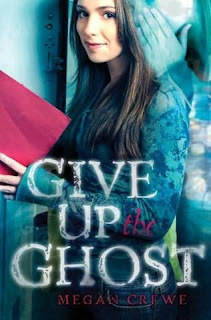 Overall: I really enjoyed Give Up The Ghost. If it had been longer, I would have been happy to keep reading! It does end at a good point though! It is a quick light read. Go Read it Now! Cover: I think the cover is cute! It fits! This sounds cute, but from your review it sounds like it might be one of those YA novels that's just a little bit too YA for me. I just finished this one as well and it was a cute little story. Not too deep and not too fluffy lol. Glad to hear it was worth the wait. This one is still on my wish list. Thanks for the review. I have it in my TBR stack tooo... I been trying to get to it. I am happy to know you enjoyed it and that its a good book! I cant wait now :) yaay!